Why Being Stuck On A Tarmac With The Philly Orchestra Rocks : The Two-Way Doing the impossible, four members of the Philadelphia Orchestra turned a three-hour flight delay into something magical. 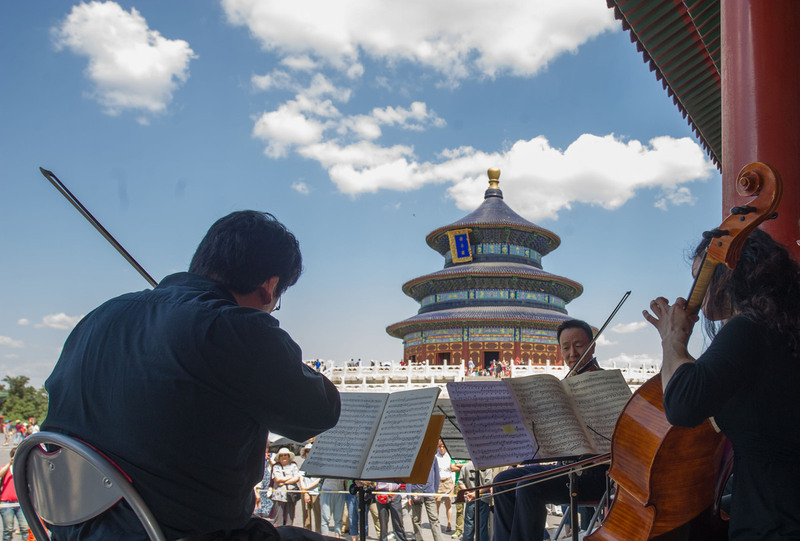 Artists from the Philadelphia Orchestra perform at the Temple of Heaven in Beijing, capital of China. There are few things as annoying as being stuck on a tarmac — in a cramped, packed plane — for long periods of time. But when you have some of the members of the Philadelphia Orchestra on your flight, it could turn magical. It happened to passengers on a flight from Beijing to Macau, this week. They had been sitting on the tarmac for three hours when a quartet of musicians from the Philadelphia Orchestra pulled out their instruments and provided what they called on YouTube a "pop up" performance. The bigger story here is that the Philadelphia Orchestra has returned to China, 40 years after its visit cemented the re-establishment of an official relationship between the United States and China. "Now, 40 years later, the Philadelphia Orchestra is commemorating the anniversary of its visit with a two-week, multicity tour of China, consisting of multiple concerts, small pop-up performances at important cultural sites, master classes, lectures and community outreach visits. The tour concludes on Sunday night with a concert in Macau." If you've kept track with this blog, you might have noticed that we have a thing for performances in surprising places. Last year, we told you about the Copenhagen Philharmonic performing before an unsuspecting public at Copenhagen Central Station.